Would you like a chance to win a Kindle Fire? Yep, I thought so! This giveaway is sponsored by 2 Crystal Chicks and hosted by So Lo La' Deals, Saving and More, and Debt Free Spending! Giveaway ends 7/6. GOOD LUCK! I would like to win this for my hubby. He loves to read. Would love a Kindle... thanks! I'd be over the moon if I won a Kindle Fire, for my long commutes to work, and for taking to the cottage. Thanks for the opportunity. I'm having a hard time signing into So Lo La Deals, I'm just wondering if I was registered or not? I need one as I have rheumatoid arthritis and it is hard for me to hold a book. Thanks for the opportunity. What a wonderful prize. I've been really wanting to get a Kindle Fire. This would be wonderful to tote along with me, so I can read whenever I get a chance. This would also be great to help encourage my son to read too. 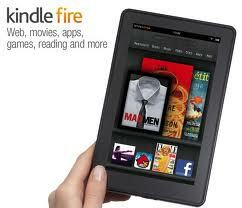 I would love to have a Kindle Fire!! Thanx 4 the awesome giveaway! This is such a great giveaway! I hope I win :) Shared on facebook! I homeschool my 8 year old daughter, this would be a great tool. I kovet the kindle. I have kindle-envy:) Like everyone else, I really would like to win. Thanks...Happy 4th! A kindle is on my birthday list - Its coming up! Hooray! I would love to win this. I read constantly and this would be so much better than packing my books back and forth from school and home. I would love this, I'd probably start reading a lot more if I had it! My wife has a Kindle Fire and she loves hers. My little girl is envious. i would so love to win this .. Thanks for the chance to enter! I love Amazon's selection of e-books, and their Lending Library is pretty sweet, so I'd love to win the Kindle Fire. Thanks for the great giveaway, this would be awesome for my commute! Would sure love to win this Kindle Fire for my daughter who just became fond of reading and would like to encourage her to continue reading. This would be a great win for me! I have tried and tried to win one of these because I really like the fact that they will replace paper one of these days and maybe we will have more trees and cleaner air! I like to read, just don't like trees dying for my pleasure. Woah, this is amazing! I'd LOVE a Kindle :) Thanks for the chance! This would be a phenomenal gift for my mother. I'd love to win this - thanks. This would be great to have while traveling! Happy 4th and Good Luck to all in the drawing! I hope you have a happy & blessed Fourth! This would make a great gift for my hubby! I would love to win this Kindle Fire and brag to ALL my friends and co-workers. I'd love a kindle fire. Would make it easier to read than with my phone. I would love to win this. I can't afford a new pc or a new smart phone so winning this would be awesome. I would love to win !I've always wanted a kindle. My kindle keyboard broke, like a week after the warranty!?! This would be wonderful! My husband had his kindle stolen while deployed to Iraq. Holding out to be able to afford the Fire so winning one would be heaven sent! Thank you for having such a wonderful giveaway! I have really been wanting a Kindle for a very long time. I have been dreaming of owning a Kindle, God bless you for this giveaway. Thank you so much for the chance to win such an awesome giveaway! Thank you for the chance at a Kindle Fire! I would love to win this for my husband, he loves to read and work on apps. Thanks! Thanks for the chance to win a Kindle Fire. These look awesome! My little man would love for me to win this.Thanks for a chance. Wow! This is one awesome and generous giveaway! Thanks for the chance to win one! I would really love to win a Kindle Fire. I would love to win this for my mother-in-law. She would be so amazed by the Kindle Fire. Would love a Kindle of any sort! Can't afford one, so I'll just keep entering giveaways. Bound to win eventually, right? Hehehe. I've been dying for a kindle fire!! Thank you for a great giveaway, I hope I get this. Great prize - thanks for hosting. This would be perfect to win, so I would have any book to read at a push of a button.